Unless you live under a rock, I’m sure you’ve noticed that Diablo III launched today. Two AM was a bit late for this working woman to stay up to catch her first glimpse, so I’ve been playing for the past five hours or so. It will come as no surprise to my audience to know that I’ve made a Demon Hunter named Tigress. Tigress is quick, lethal and a blast to play. I’ve noticed that gameplay FEELS like Diablo II. Combat works traditionally and enemies spawn in interesting ways. The environment is dark, dreary and beautiful. I enjoy stopping now and then on my journey to spend time soaking up the scenery, that I then proceed to splatter zombie guts all over. Although the gameplay is traditional, I can see where Blizzard decided to deviate from some small ways. The development teamhas gone back and forth on whether players should manually click to pick up gold, or if the player should have access to dungeon minipets to collect the resource for you. The team seems to have settled somewhere in the middle resulting and the player is now required to run over or near gold to collect it. Scrolls of identity have been completely tossed out the window, identifying is required for top quality items only and there is no scroll required. For those who are familiar with Diablo II, its almost as if you are can imagine the round table discussions of the development team straining their brains over these details. A lot of these changes have been made since the beta launch, so a lot of these tweaks are relatively last minute. A lesson the whole gaming (and game development community) should note is the perils of the age of online only gaming. Producers are protecting themselves from game piracy by requiring users to be connected to Battle.net servers even if the gamer wants to play solo. There are some small advantages to this, data can be tracked serverside protecting users from lost data and duped items. The downside is that players must have an internet connection established to active blizzard servers even if they want to play alone, you know, without others, OFFLINE. This is enough of an annoyance if you’re in a location with poor or no internet. 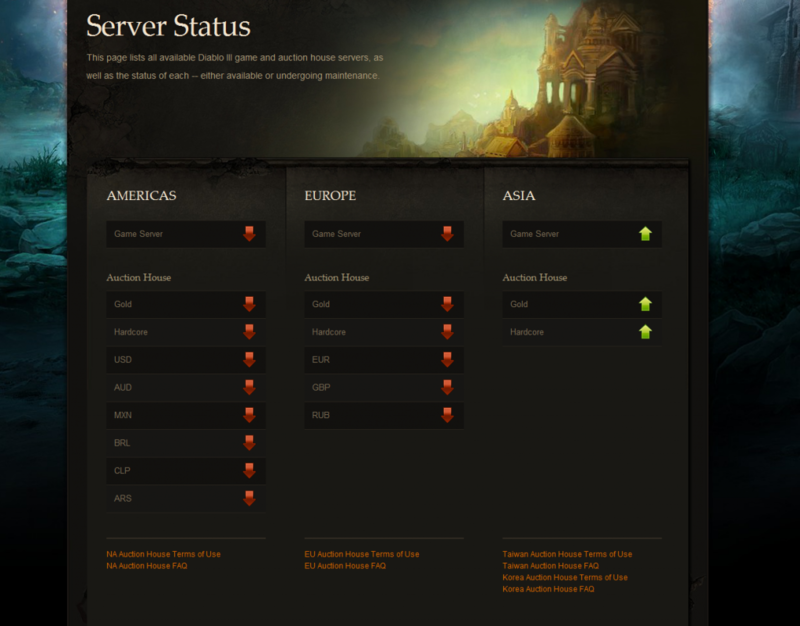 But imagine what happens if Diablo III servers go down at 10:30 pm central time on launch day. I’m absolutely shocked that a company with Blizzard’s resources, experience and reputation would fail this hard on launch day. I doubt I would have bothered to blog here at all if the servers were still up. I guess this means it’s time to go to bed. 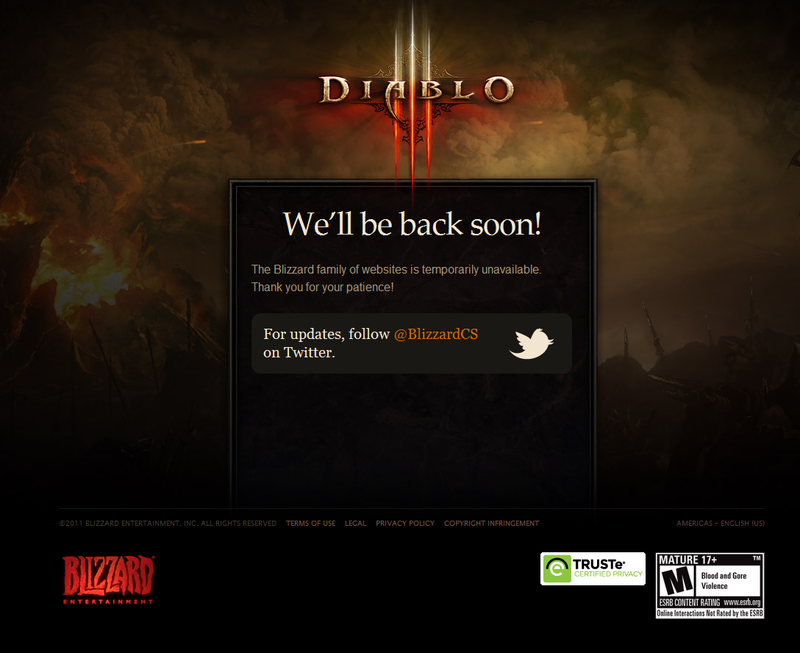 As Blizzard’s”Temporarily Unavailable” Diablo 3 website states; “We’ll be back soon”. Note that the site was quickly reworded to say that it’s “Down for Maintenance”. Riiiggghtt. . .